BIG SAVING: Are you a Developer? You love this template and other our Joomla items on ThemeForest, as well as products our official site (SmartAddons.Com)? NOTE: Some Exclusive Joomla Templates on ThemeForest will be not included! If you have question, please contact us! 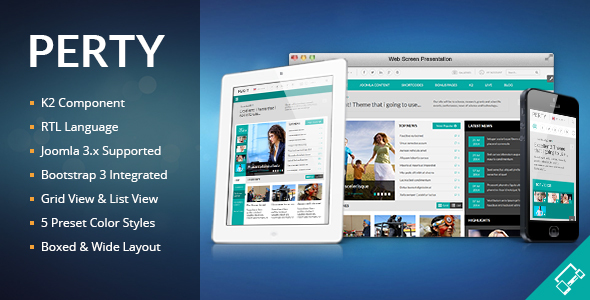 SJ Perty – An exquisite Joomla template for news/magazine websites. By use of the powerful slideshow, your news will be attractively presented with image, title, date and comment counter. Besides, your top video is displayed as a pop-up window, you don’t need to move to another page. It makes your website become more convenient to use. In addition, with SJ Perty, you can build an interesting website upon nice hover effects on each items. Used latest web technologies like: HTML5, CSS3…, SJ Perty comes out with many cutting-edge features. It is totally responsive and working well on any devices, web browsers. Furthermore, based on the latest YT Framework version, SJ Perty allows you to easily control, customize your website in seconds without much coding knowledge. The template is released in 5 color styles: Blue (default), Brown, Green, Pink and Violet. You can preview how they look as well as customize the Layouts, Menus and Reset instantly by using dynamic Cpanel through a standart web browser. Equipped with K2 component and many content related extensions, SJ Perty completely adapts any daily news and magazine websites with up-to-date international news, weather, travel, entertainment, finance, sport and more. Discover this eye-catching template and get the real experience now! The powerful Joomla template framework – YT FRAMEWORK V2 is flexible with Bootstrap3 at core. You can easily customize most of SJ Perty parameters without much coding knowledge. The template is totally responsive design as well as easy to configure with a wide range of easy tasking features: colors scheme, menus, typography, Google Font… Specially, this is compatible with Auto Updater component of Joomla! to update framework any time to latest version from our repository. SJ Perty is designed with 5 Preset Color Styles: Blue (default), Brown, Green, Pink and Violet. You can also totally change your color for all params: body, header, spotlight, footer… by using c-Panel. With YT Framework at core, SJ Perty is fully responsive Joomla template and looks delightful across different devices and screen layouts as well. SJ Perty is integrated with K2 component which is highly suitable for a news/magazine website. For K2 items, you can arrange them in from one to four columns as you want. There are two way to display your items: Gird view and List view. For both of them, the items will be shown with title, short description, date and comment number. SJ Perty provides a comfortable way to view videos or images in a pop-up window without turning to other pages. So great! Our design brings you a wonderful feature – Powerful Slideshow, that help you to represent your recommended items. These items will be presented with necessary information: images, titles, brief descriptions, detail link upon nice effects. This is an interesting feature for SJ Perty store. It helps to show more options like: photo zoom, detail link… on mouse hover in new image. SJ Perty is available for a wide range of worldwide languages. Switching between different languages is very easy. Specially, The template also supports RTL (Right to Left) language based designs like Arabic, Farsi & Hebrew…. Built an the extremely powerful Joomla site with minimum effort by getting these awesome bonus pages: Q&A, Portfolio, Testimonial, Contact Us, About us, Photo Gallery, 404 Page.